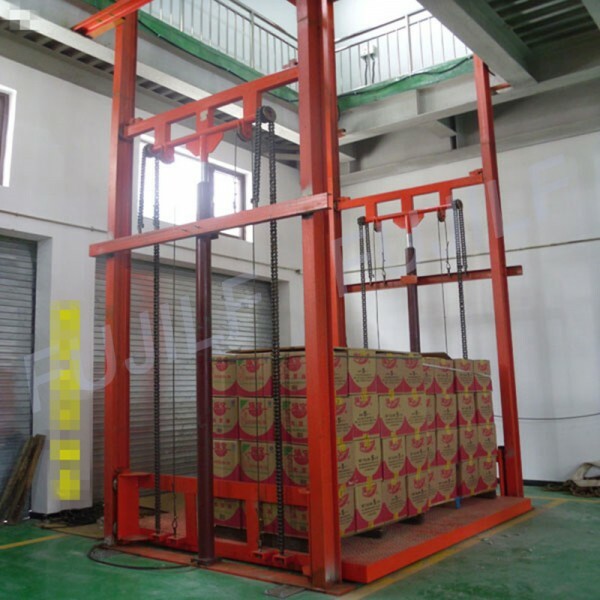 1.FUJILF guide rail hydraulic platform lift is a non-scissors-type lifting platform, for two, three industrial plants, restaurants, and transport of goods between floors. 2.As the minimum height is only 150-300mm, best adapted to not digging pit of industrial situations. 3.It have many forms (single column, double-column, four-column), smooth movement, simple operation and reliable, hydraulic, Electric multiple protection, so that transmission between floors can be economic and relaxed. 4 FUJILF lead rail platform lift made delivery heavy duty cargo more easy and convenient . multi-point control, mutual-lock between upper and nether layers, so to make a safer operation. 5.It is suitable for 2-6 layers’ steel structure workshop, and can be used inside or outside of the workshop. 6. Hydraulic cylinder as the main driving force, and through the heavy chain and wire rope to ensure the absolute running security. 7.The pit and machine room is needn't, especially suitable for the basement, warehouse renovation, new shelves. 8.With easy installation and maintenance, beautiful, safe, easy to operate. 9.This guide rail lift platform is produced according to the Physical environment of the site. 10. Electric and manual drop, emergent stop button is convenient and safe. 1 Overfall valve: To avoid over loading when it is moving up. 2.Emergency manual valve: In case power off, the lift car may drop to the nearest layer to open the door. 3.Manual pump: When failure occur, operator may use manual pump to give high pressure oil to get to the nearest layer. 4.Pipe broken protection valve: When lifting car drops fast as oil pipe broken, use the valve can make the lift stop dropping. 5. Oil temperature protection: When temperature of oil is overheat, there is signal given out, stop the lift when temperature get normal, start again. 1) We can design the customerized outside elevator as per your requirement. 2) The most suitable outside elevator will be recommended to you once we got your requirement. 9)We could reply you in 2 hours after received your any questions even on weekend and holiday. Engineers are available to your country if necessary.